Object Of The Training Session – Teach your players to have the confidence to switch the play from one side of the pitch to the other with accuracy and intensity, progressing the practice into a drill and ultimately a game situation. Practicing The Skill – Players 1 and 2 face each other, about the full width of a pitch, with the third player positioned in between. Player 1 accurately passes the ball to player 3 who lays it off with his first touch for player 1 to pass and follow the ball to player 2. The second player receives the ball and with his second touch, plays a long range pass to the other side of the pitch where player 3 will now be positioned. The sequence continues and the drill is repeated as shown in the diagram below. Developing The Drill – Player 1 starts with the ball at one side of the pitch and plays a long ball to player 2 who is positioned on the other side. Player 2 plays a 10 meter pass and moves behind the third player who passes the ball down the line, into space for player 2 to run onto and deliver a cross. Player 1 who initially started the drill tries to meet the cross to score. Player 3 moves to where the second player was positioned and the fourth person repeats the drill by continuing the sequence as shown in the diagram below. Moving The Drill Into A More Realistic Game Situation – This drill is the same as above, but with the introduction of defenders. Players 6, 7 and 8 are the defenders as shown in the diagram. Player 8 starts in between the first 2 players to try and stop player 2 from passing to player 3. The seventh player marks player 3 and tries to stop him from playing player 2 into space to deliver a cross. The sixth player is the central defender who’s aim is to prevent player 1 from scoring. The fourth person repeats the drill by continuing the sequence as shown in the diagram below. Game Situation – Finish with a normal game on a full size pitch if possible, encouraging your players to switch the play between wings when appropriate. 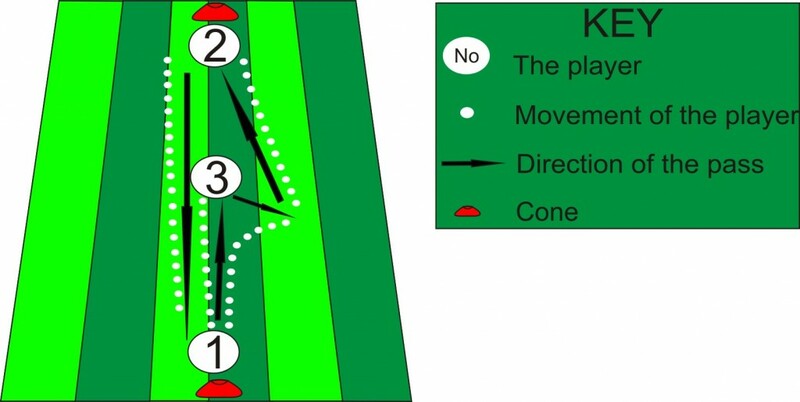 PENDLE VERDICT – Just be careful with the first drill that players do not work to hard between cones. The focus should be on accuracy of pass rather than intensity at this stage.